Conservation work began on the Norwich Baby House this month in preparation for a collaborative exhibition of doll’s houses in March 2017, one at the Norwich Castle Museum, featuring a Victoria & Albert Museum touring show called “Small Stories”, and another at Strangers’ Hall Museum, featuring the conserved Baby House and an assortment of other interesting houses, furniture and dolls from NMS collections. 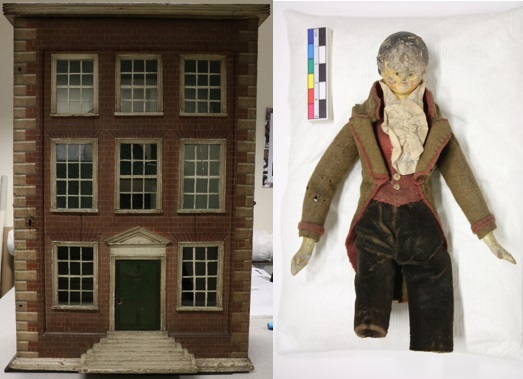 The house, which is believed to be dated around 1720, together with all the contents which are from later dates, was on display in the Toy Room at Strangers’ Hall and will be redisplayed in March with a new look case together with a trail around the museum featuring the chosen NMS objects . The trail will include a German toy castle, an Old Woman living in a shoe and a set of feather miniature furniture, upholstered in silk with metal embroidery from about 1860. After an initial assessment, the house underwent conservation cleaning, especially the 8 glass windows. 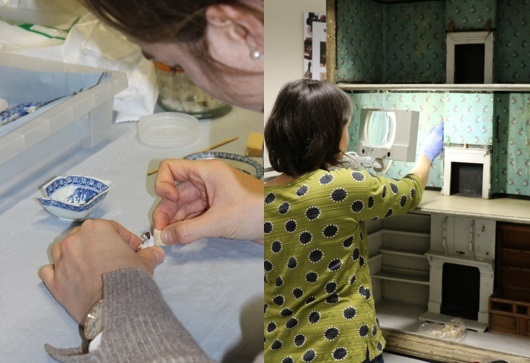 A miniature Staffordshire ceramic dinner set, tiny house ornaments and even glass chandeliers were included for treatment, necessitating the use of almost miniature cleaning tools! All the furniture, after cleaning and repair, will be reinstalled into the house along with some interesting larger textile furniture pieces. New LED lighting will enhance the interior. Such a large object with so many mixed surfaces and materials requires the careful observing of every nook and cranny to tell the story of how the house was constructed, how materials were added over the years and the change in fashions in interior design over time. It is a privilege to work on a house with such a long history and you find yourself imagining all of the people who have enjoyed it over the years.